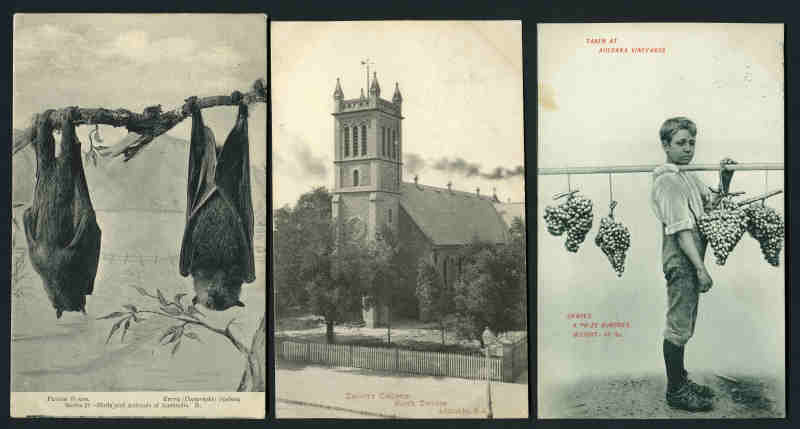 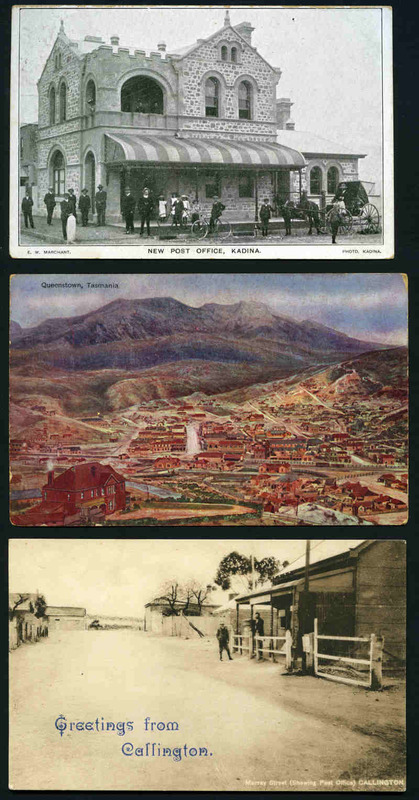 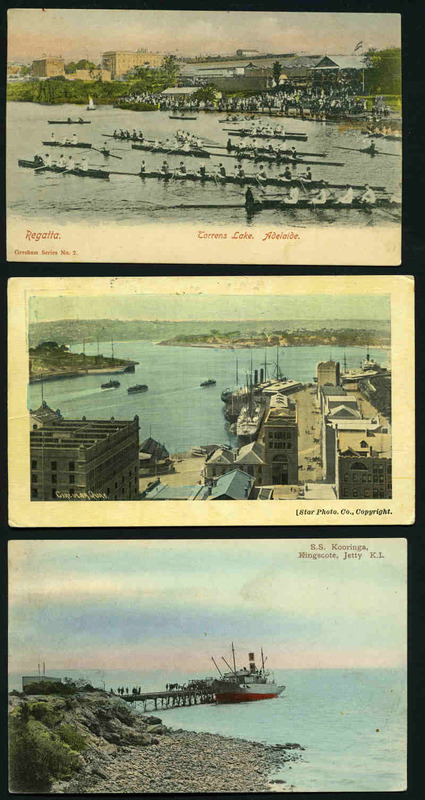 Selection of 133 early postcards mostly related to South Australia including attractive range of Building, Street and Nature scenes. 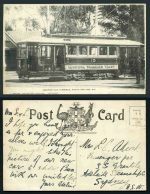 Noted Electric Car Terminus, North Adelaide. 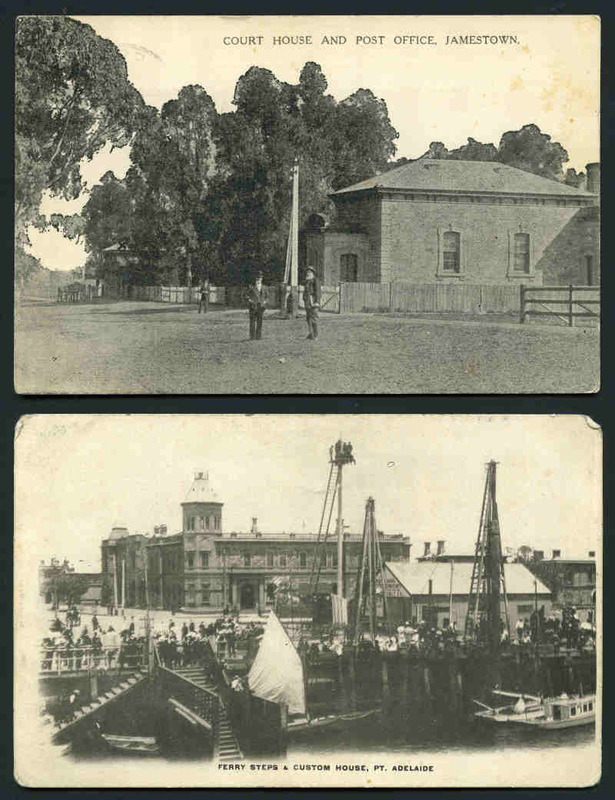 S.A., A Reach of the Murray ("Etona" Mission Steamer in foreground), McIIwraith McEacharn & Co "T.S.S. 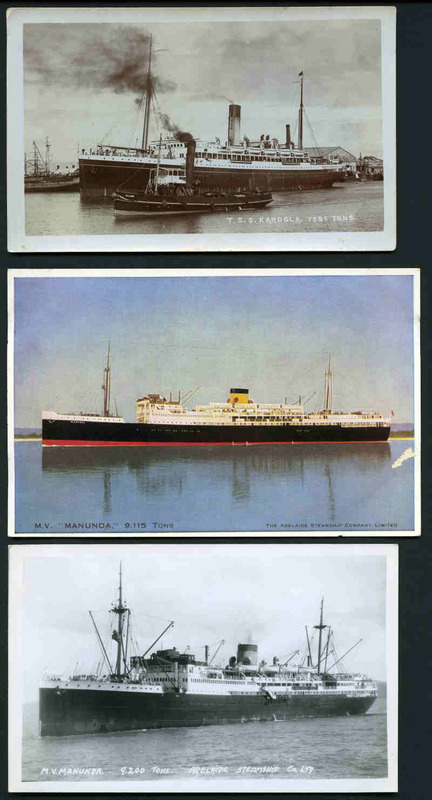 Karoola", Australian United Steam Navigation Co "T.S.S. 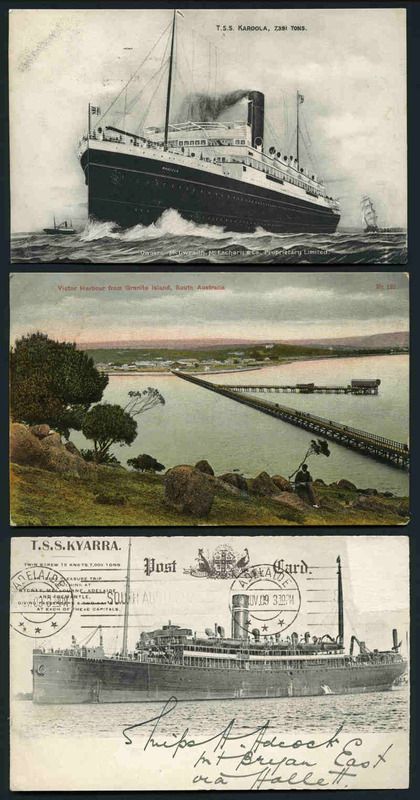 Kyarra", plus several Foreign cards including "Homewards" Shrimpers on the Yorkshire Coast by "Jotter". 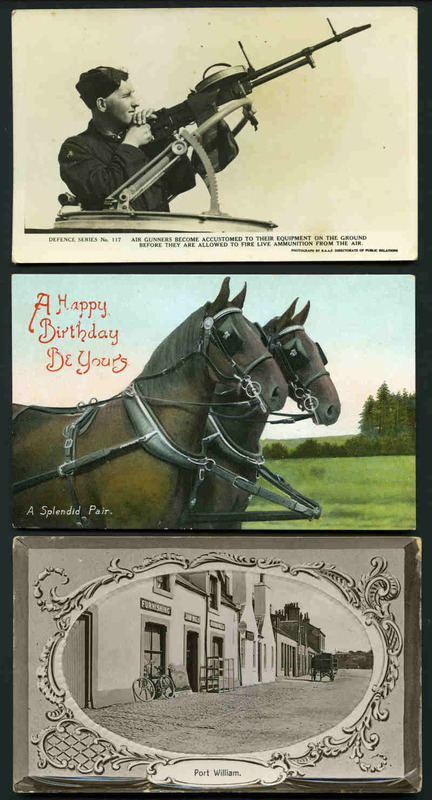 Many with squared circle cancellations. 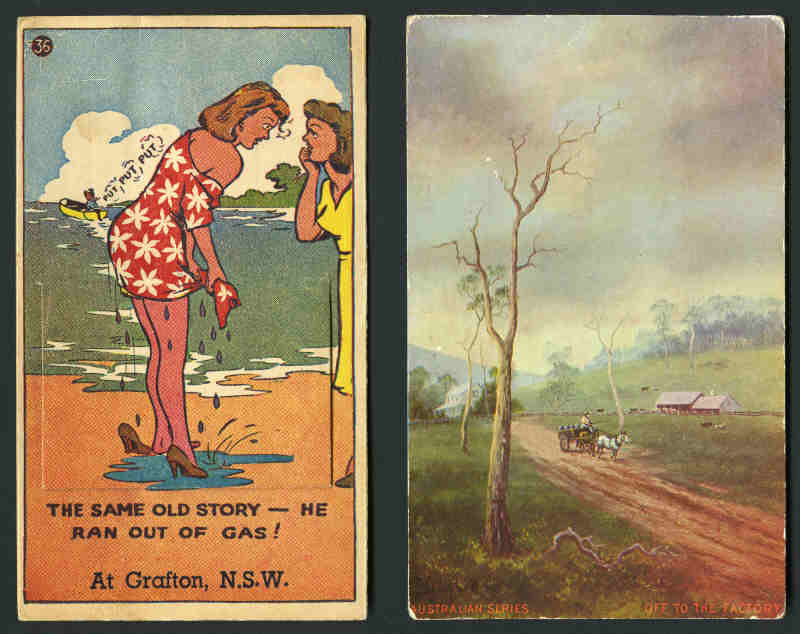 Mainly G/VG condition. 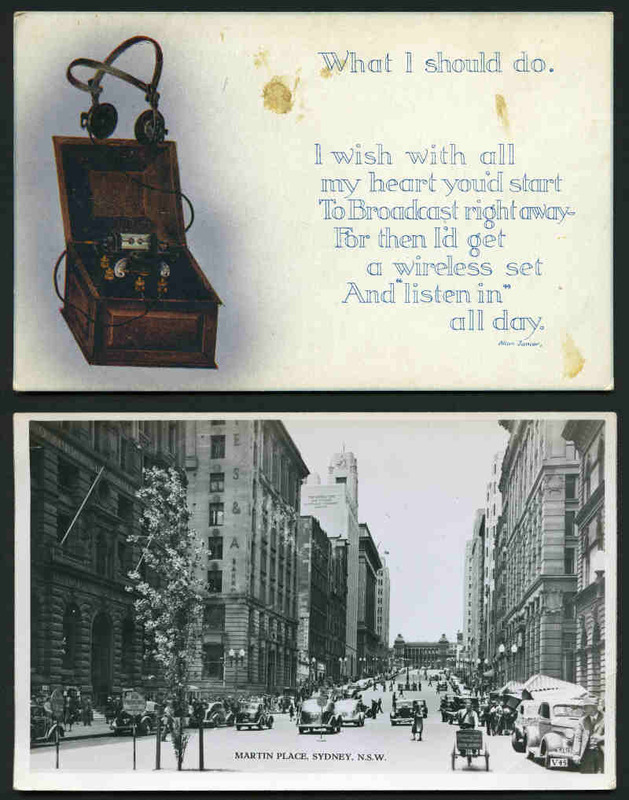 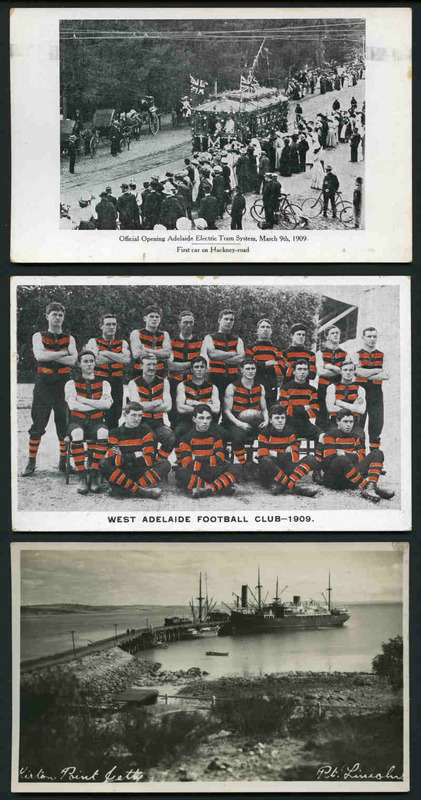 Selection of 82 early postcards including West Adelaide Football Club - 1909, "Every Little While I Feel So Lonely" and Dear Old Sport How Are You? 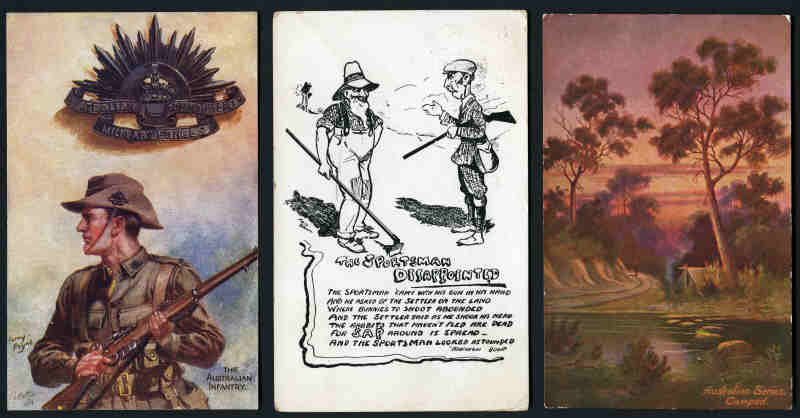 Gumnut Series by May Gibbs, Colonial Badges and Their Wearers The Australian Infantry by Harry Payne, Bank of New South Wales, Australian Jamboree Branch, Bradfield with special postmark, 'That's Why I'm The Only Rabbit On The Run!' 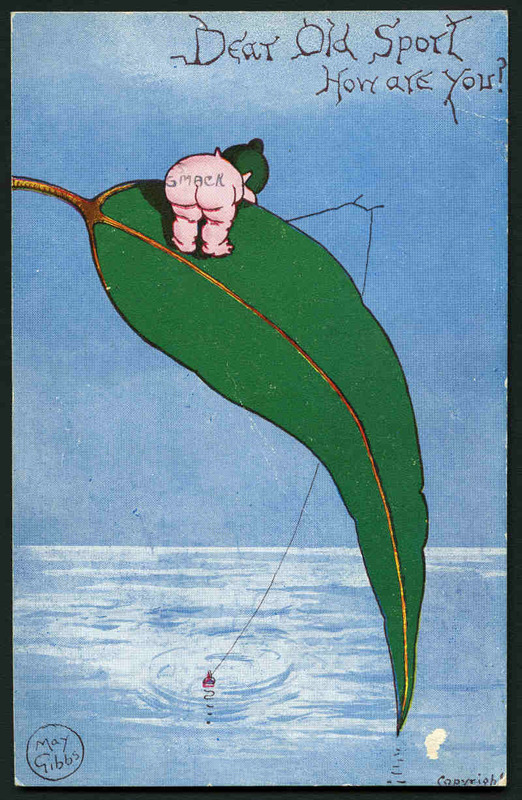 by L.L. 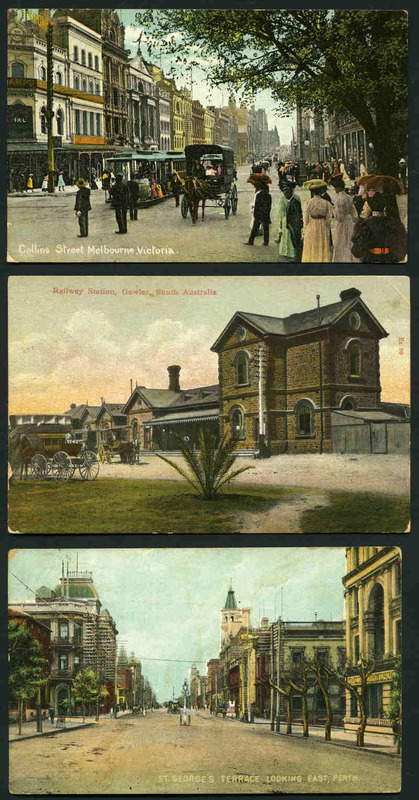 Roush, The Last Train From "Victor Harbour" by W.H. 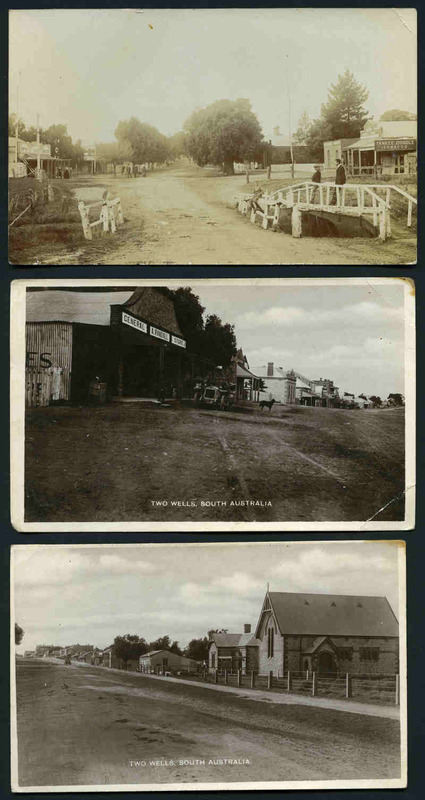 Mitchell, Australia's Glorious Day. 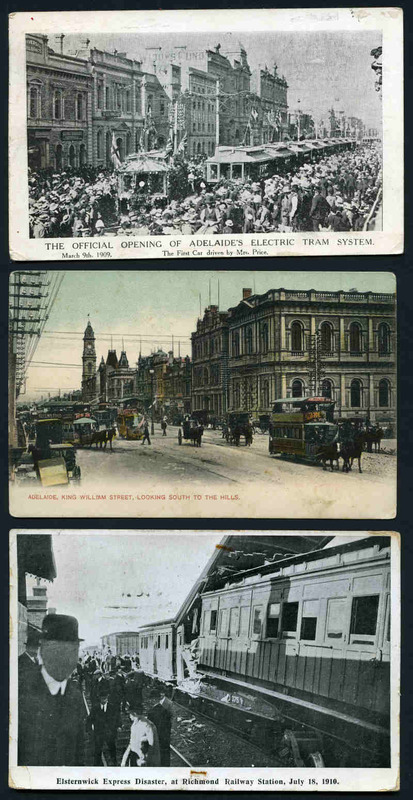 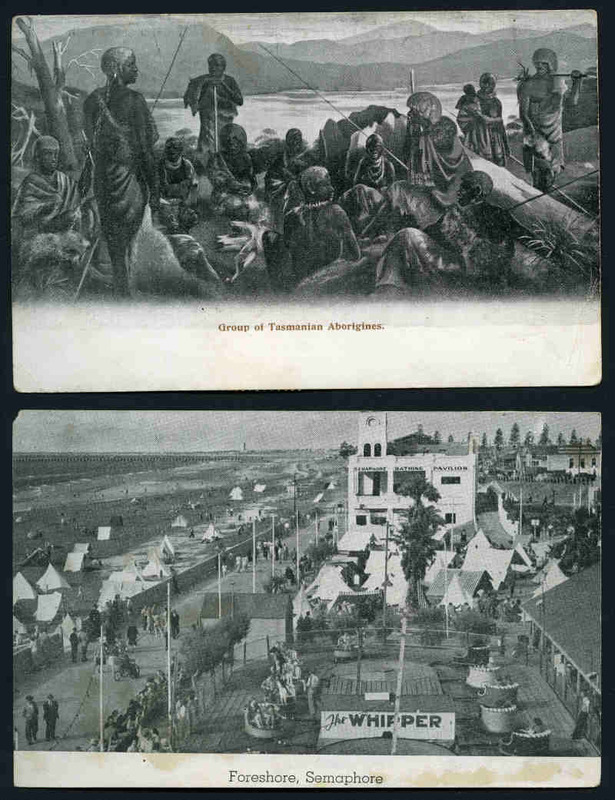 Landing At The Dardanelles, April 25th 1915 by Turner & Sons publishers, Australian Series "Camped" and "The Wheat Team" by J. Hutchings, Official Opening Adelaide Electric Tram System "First Car on Hackney-road" The Sportsman Disappointed by Fred Brown, Prison Hulk - "Success" - Adelaide and Bushrangers riding horses by Charles Hammond with Adam Lindsay Gordon poem at top. 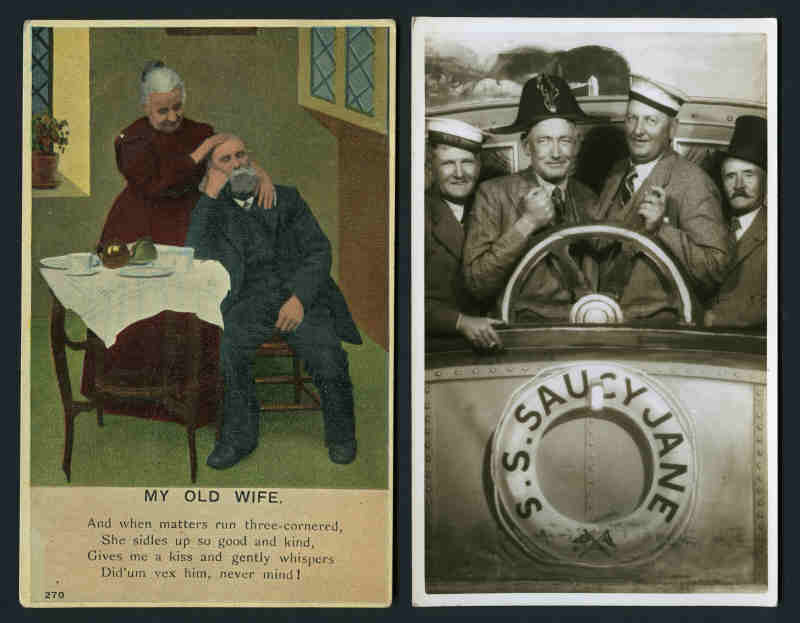 Mainly fine condition. 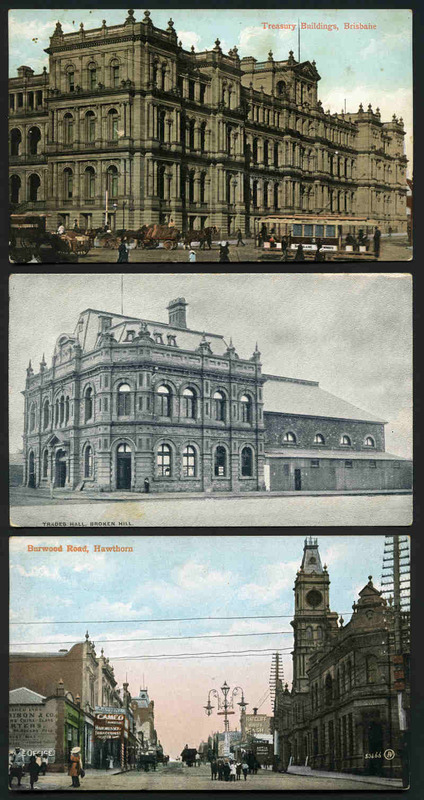 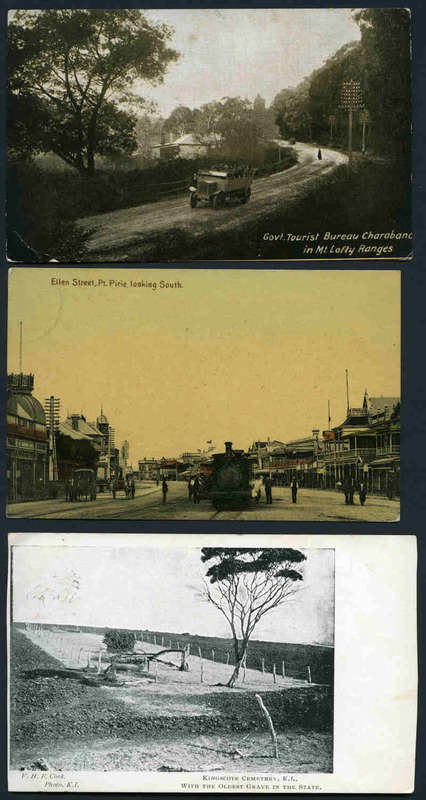 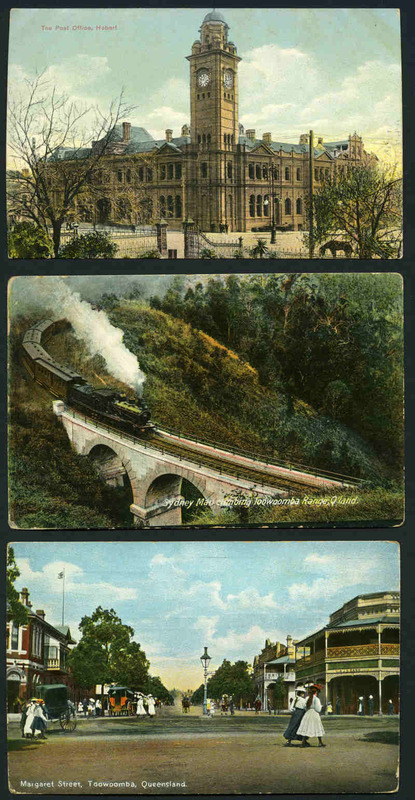 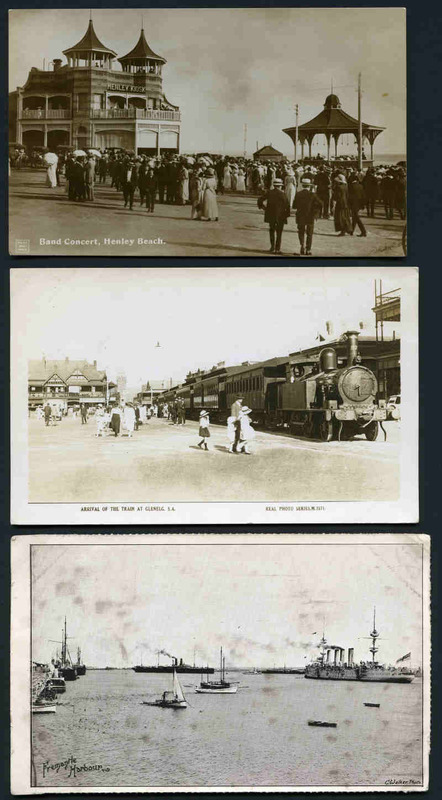 Selection of 218 early postcards including attractive range of Building, Street and Nature scenes. 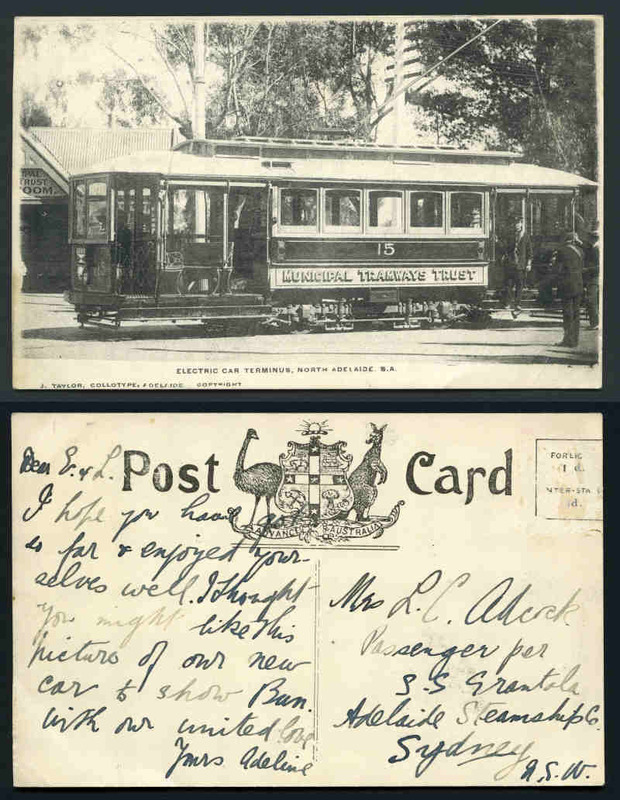 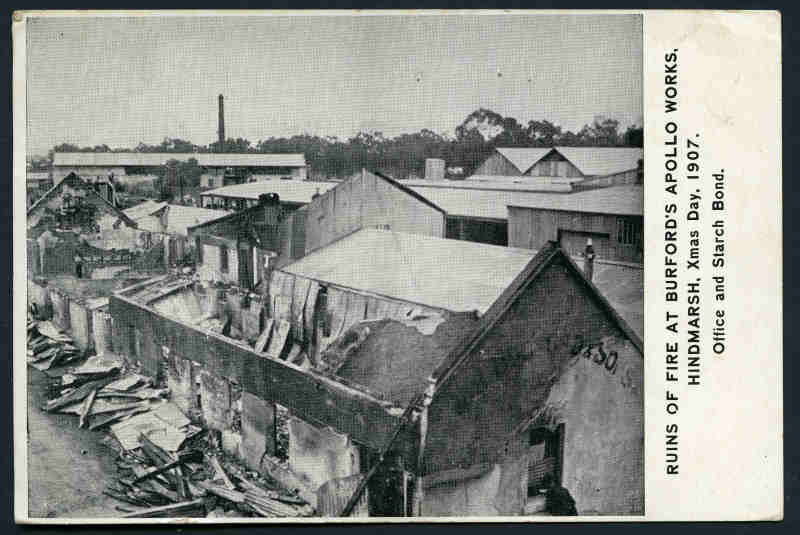 Noted Official Opening Adelaide Electric Tram System "The First Car driven by Mrs. Price", Ruins of Fire at Burford's Apollo Works Hindmarsh, Xmas Day, 1907. 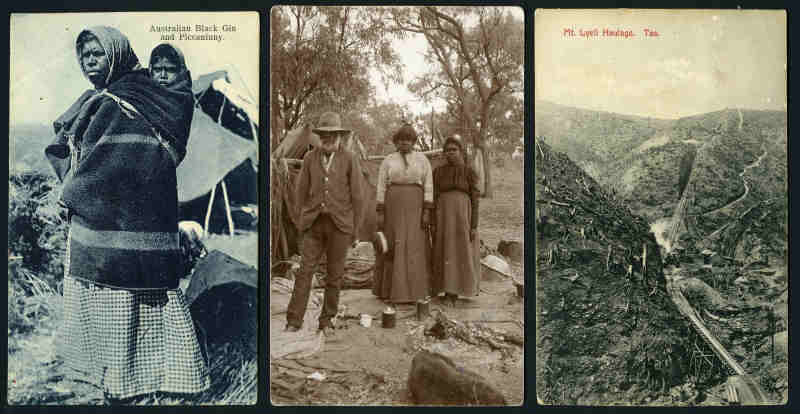 Office and Starch Bond., Kerry Photo "Australian Aboriginal Mia-Mia", P. Campbell Australian Series "Off To The Factory", J. Walch & Sons "Group of Tasmanian Aborigines" Elsternwick Express Disaster, at Richmond Railway Station, July 18, 1910, South Australia Intelligence and Tourist Bureau Phone 2538 Series of 6 views of Adelaide, Bay View Hotel, Burnie J.L. 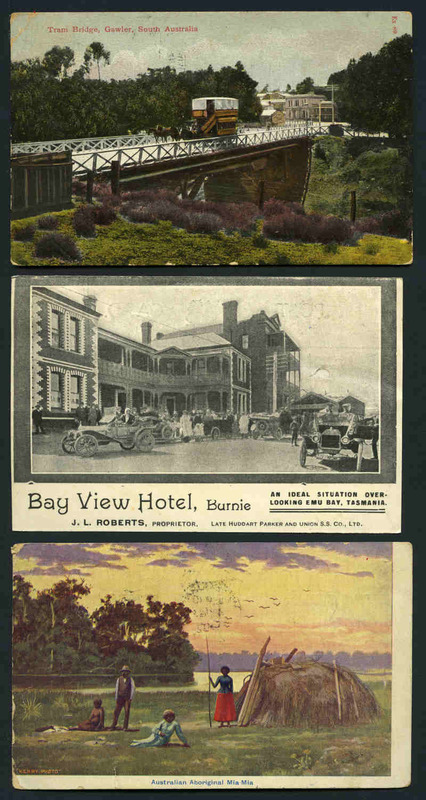 Roberts, Proprietor, Mount Lyell Railway "Mt. 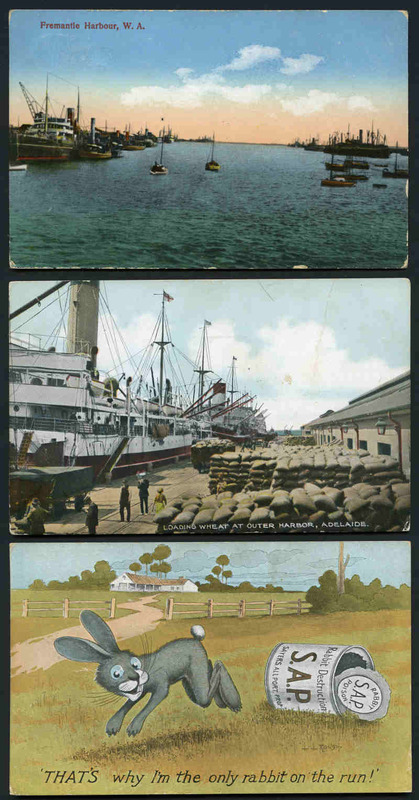 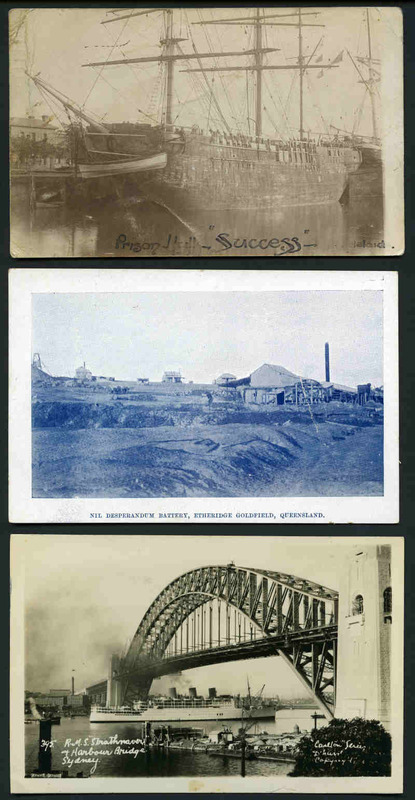 Lyell Company's Wharves, Regatta Point, Tasmania" and more. 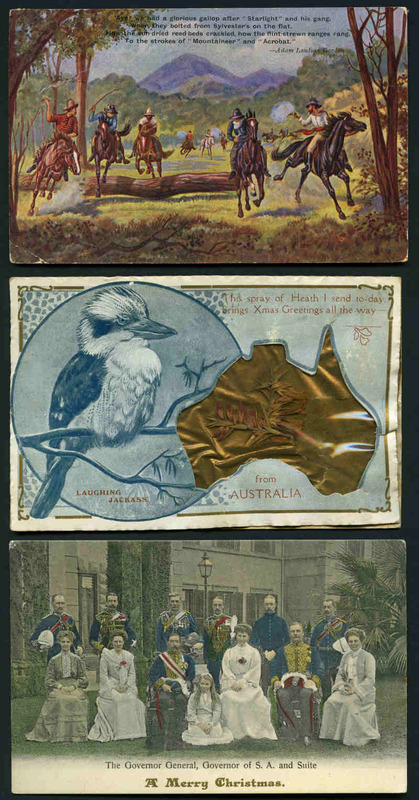 Useful range of CDS and South Australian squared circle cancellations. 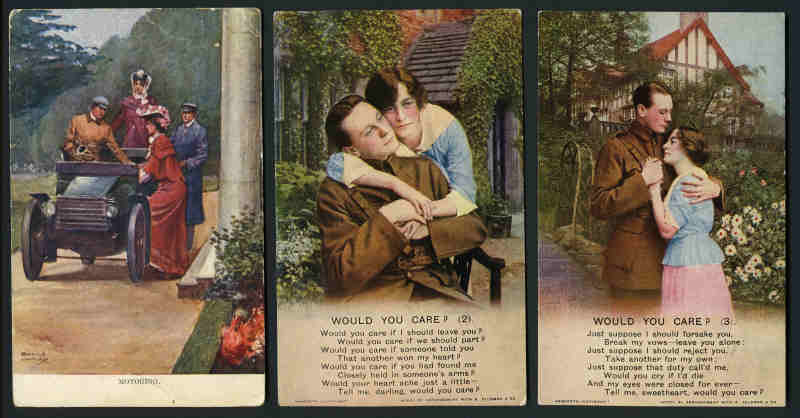 Mainly fine condition. 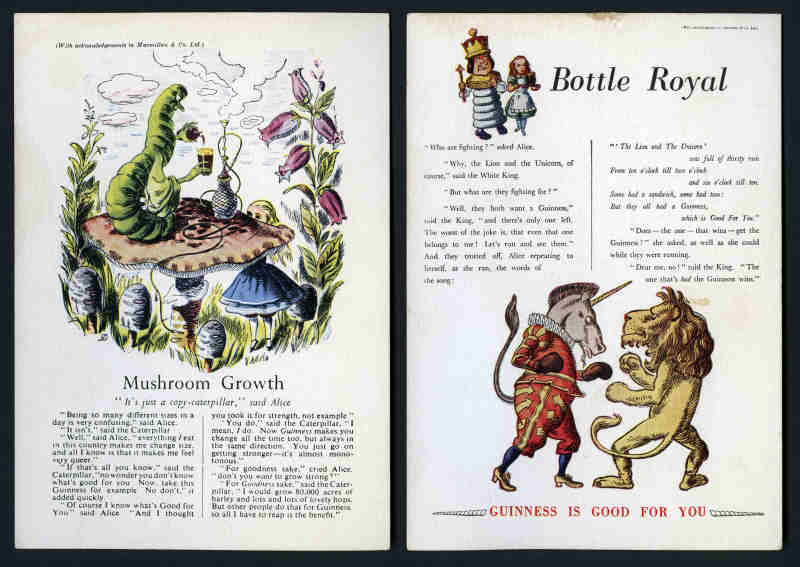 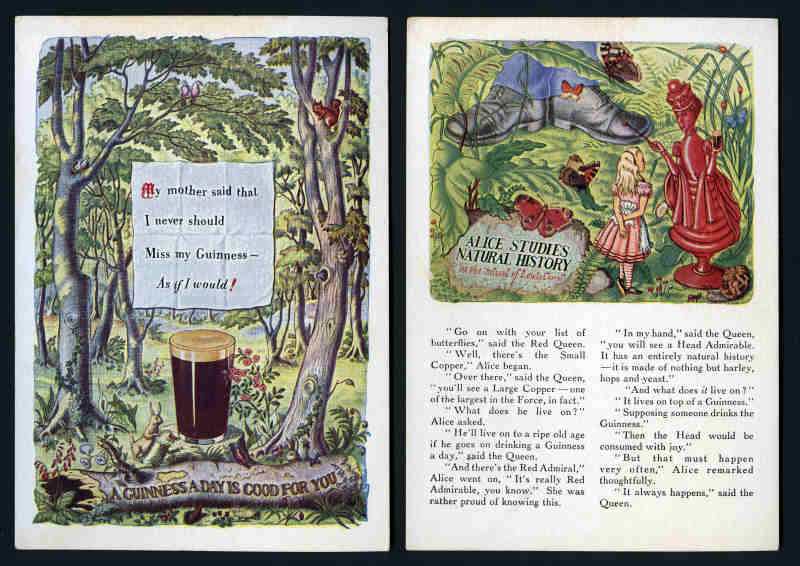 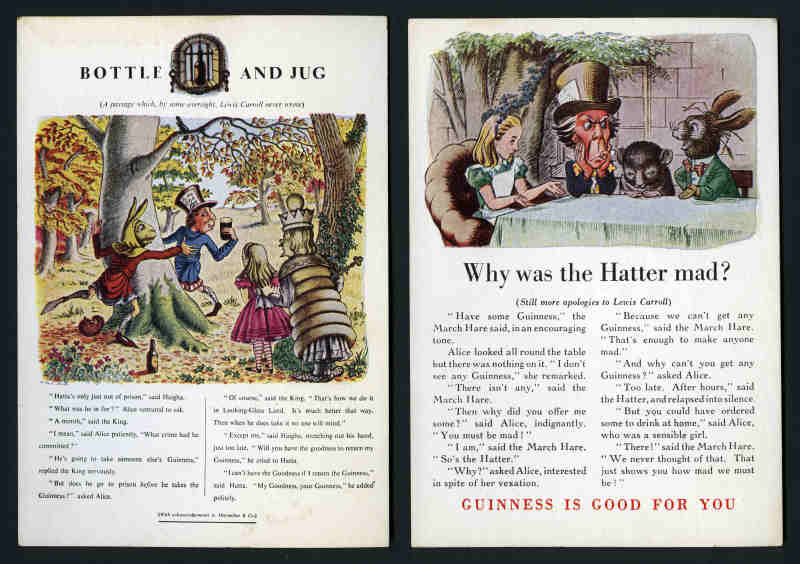 Guinness 'Set A' Alice in Wonderland set of six cards in fine condition. 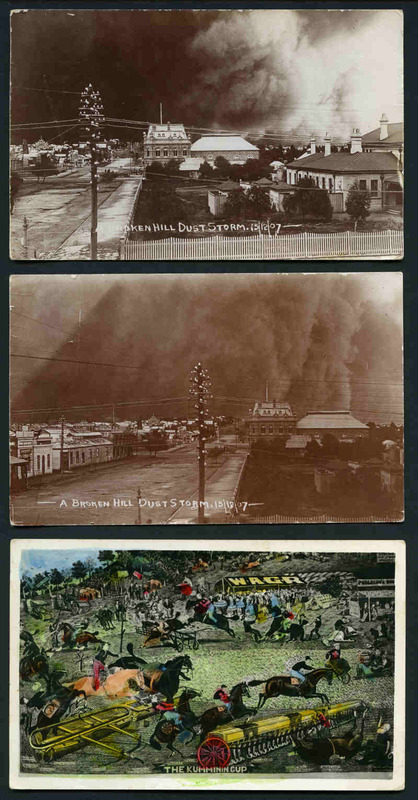 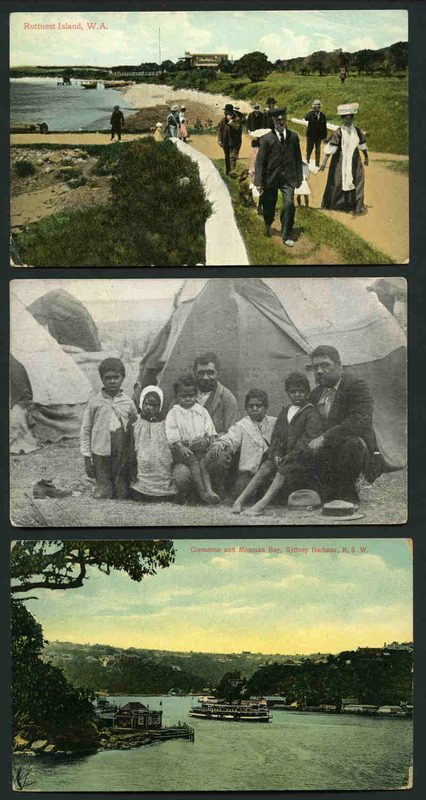 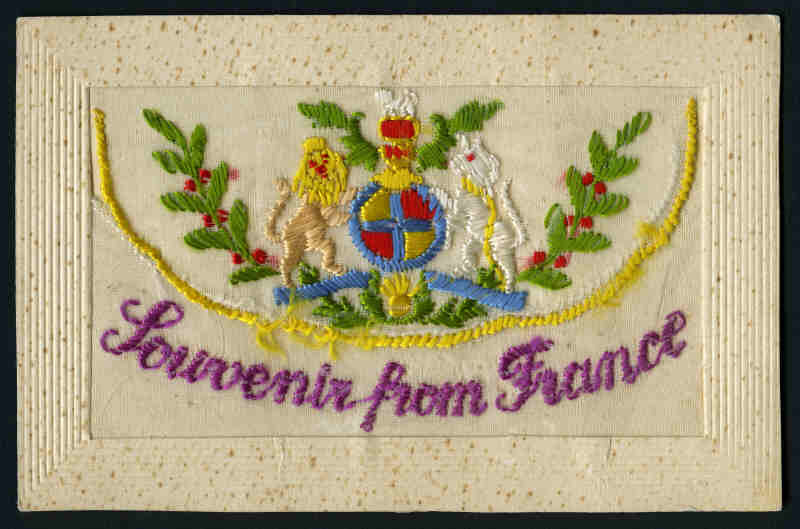 Collection of 172 mostly earlier postcards, mainly from Great Britain and Australia. 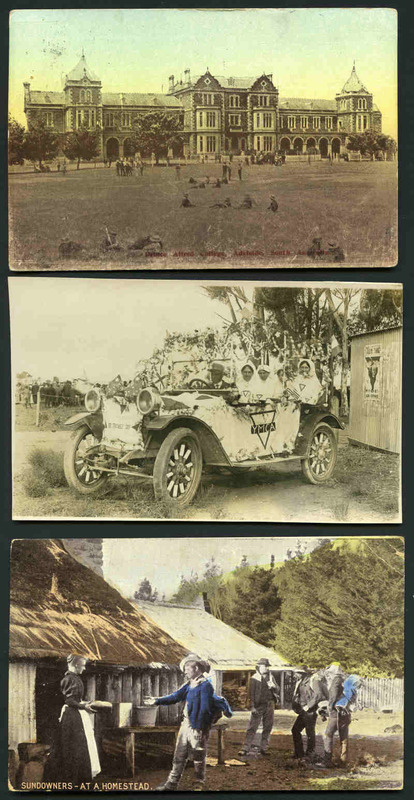 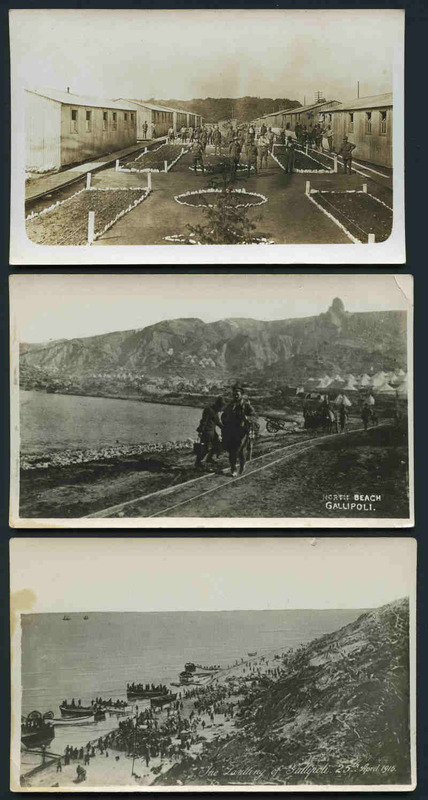 Noted North Beach, Gallipoli, The Landing of Gallipoli, WWI era car decorated with YMCA logos for Red Triangle Day at Two Wells, WWI Troops at training depot in the UK, Silk card, Fremantle Harbour, Band Concert, Henley Beach, Views of Two Wells (2), Train at Glenelg, Sundowners - At a Homestead, embossed cards and more. 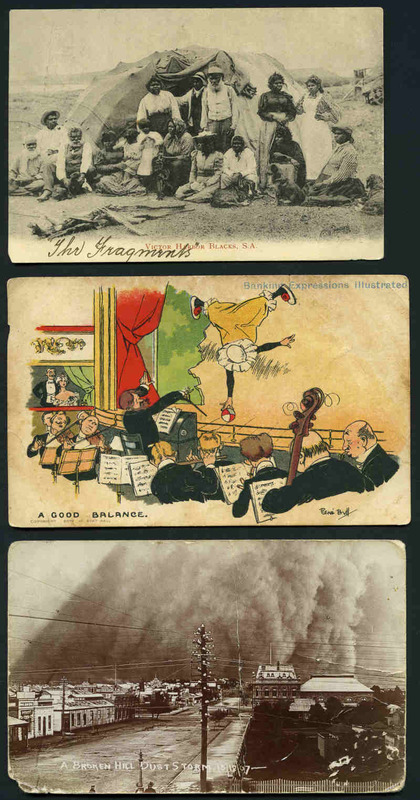 Odd fault, but generally fine condition. 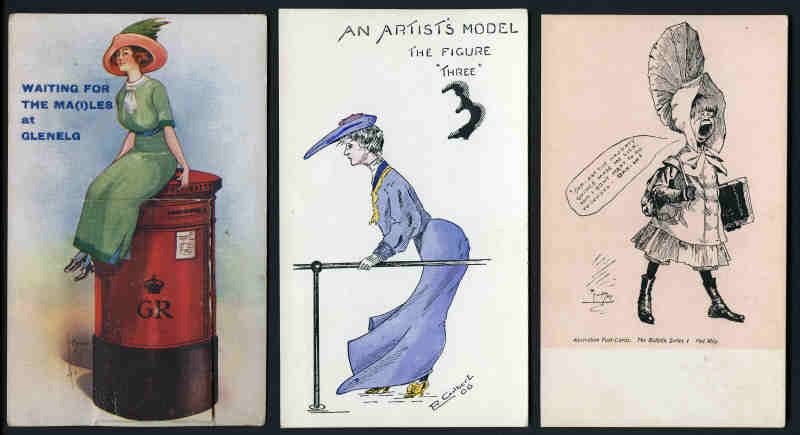 Selection of 245 early postcards mainly from Great Britain including useful range of Comic and Glamour Artist cards. Noted Mabel Lucie Attwell selection of 33 different, Ida Rentoul Outhwaite "Periwinkle painting the Petals" and "Seated on the edge of a Mauve Crocus", Louis Wain "The Perils of Scientific Research", C.E. 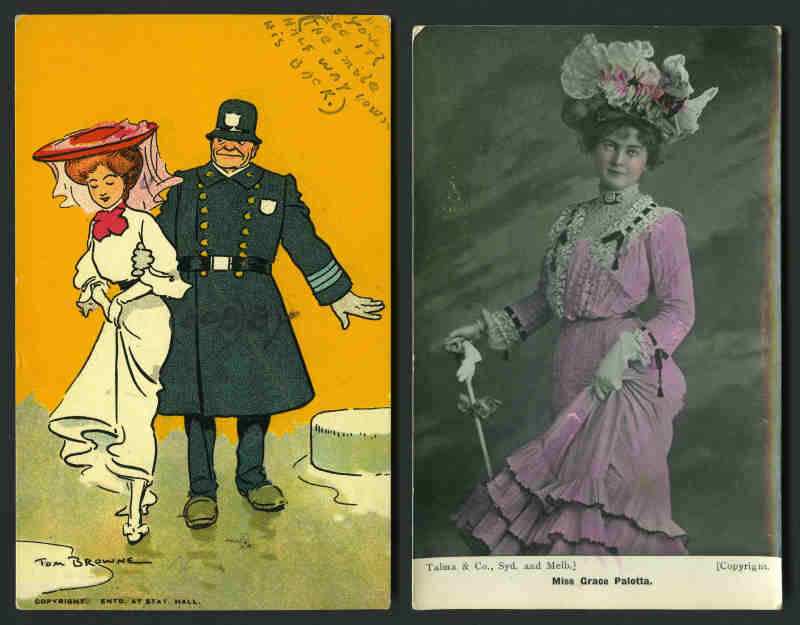 Shand "Ready for the Ball", R.Ellett "Rule Britannia", Lawson Wood "The Last Straw", Arthur Butchur "Loves Old Sweet Song", G.E.Studdy selection of 7 different Bonzo cards, Florence E Valter "We Can Take It" and "I'm Keeping My Chin Up", Donald McGill "Oh, Lor! 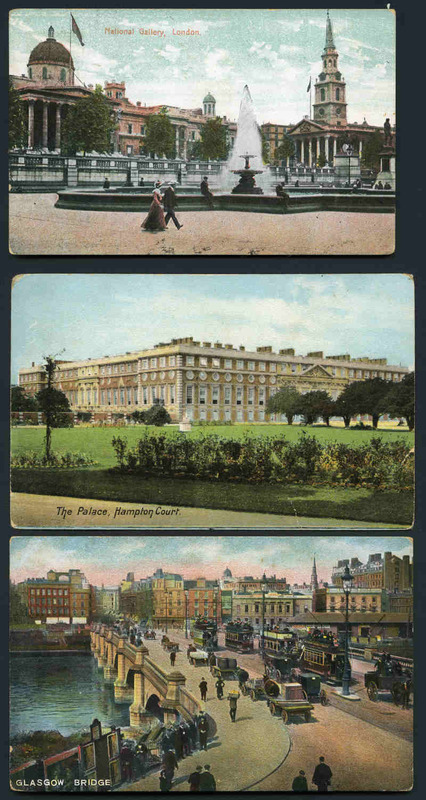 Fancy 'avin' a pain in that! 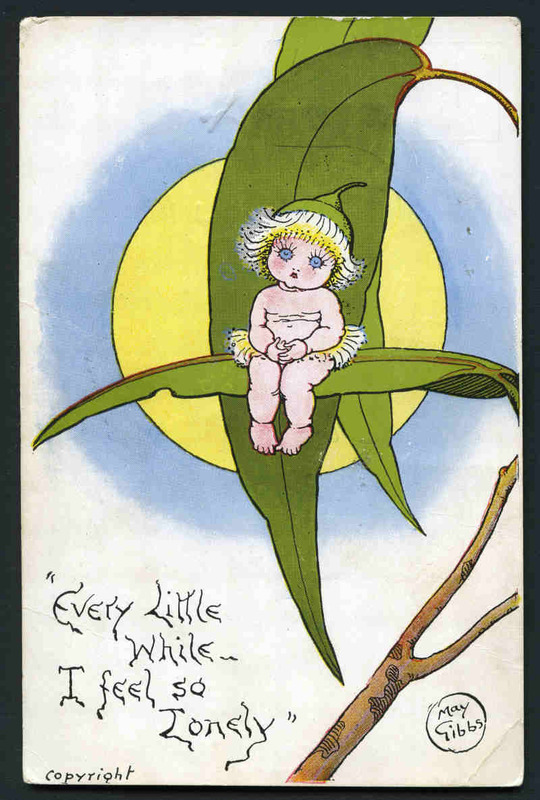 ", Tom Browne "Spring Cleaning", Alic Luella Fidler "American Girl No 24", Felix the Cat "Happy Be Your Birthday", Ottmar Zieher Stamp Embossed cards (5) and more. 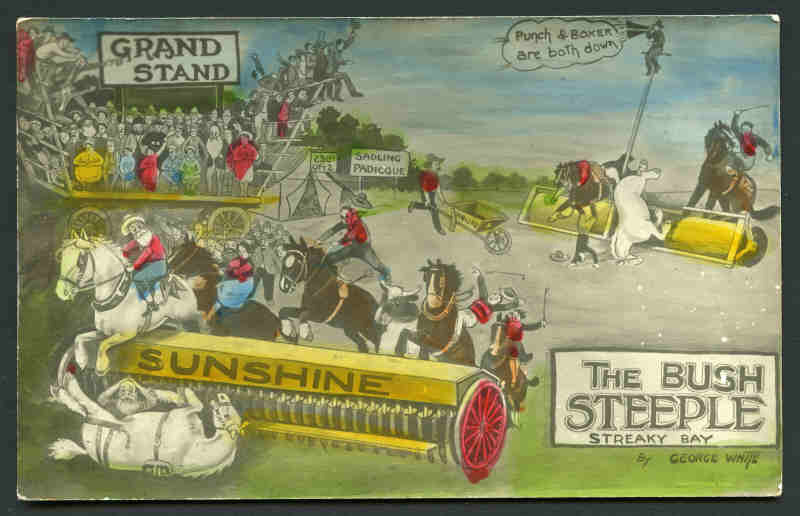 Mainly fine condition. 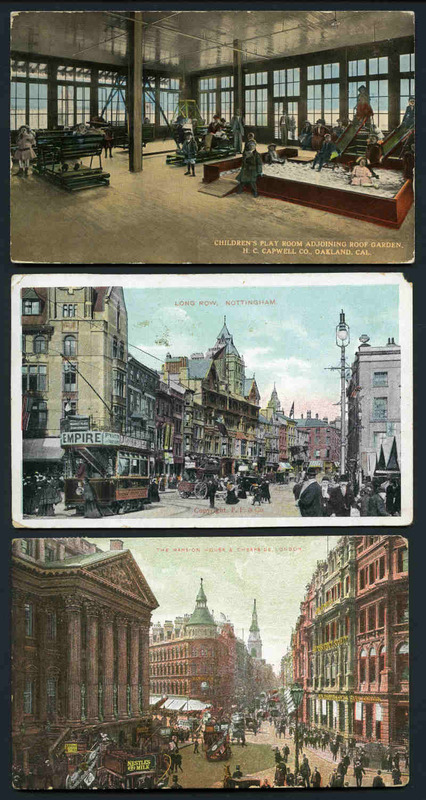 Selection of 267 early postcards mainly from Great Britain including attractive range of Building, Street and Nature scenes, Comic and Artist cards. 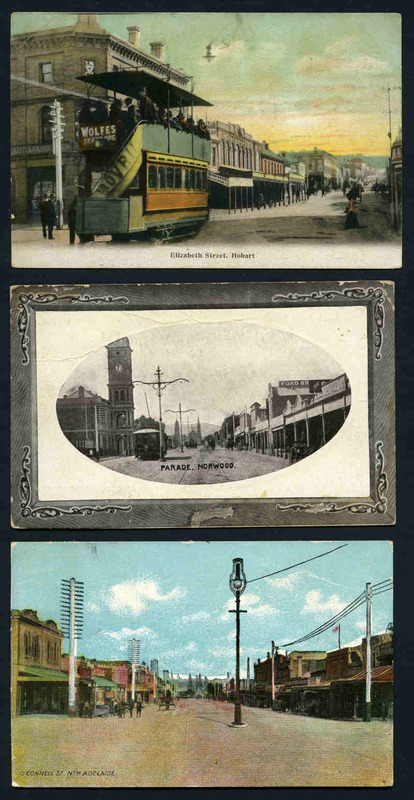 Useful range of South Australian squared circle cancellations. 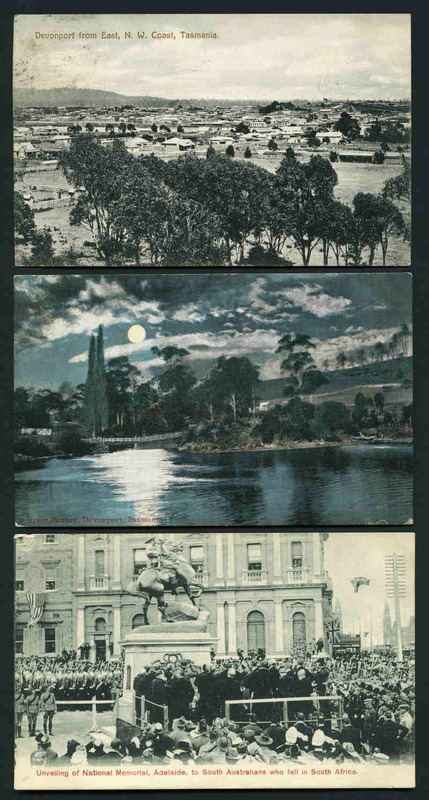 Mainly fine condition. 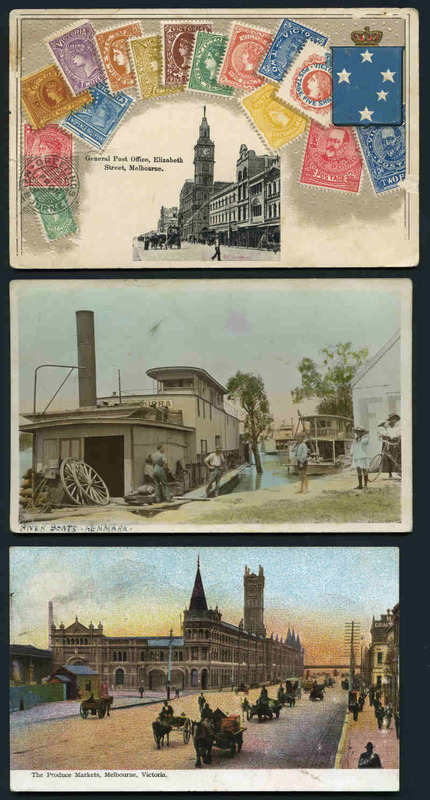 Selection of 254 early postcards mainly from Australia and Great Britain including attractive range of Building, Street and Nature scenes, Artist, Oilette and Novelty cards. 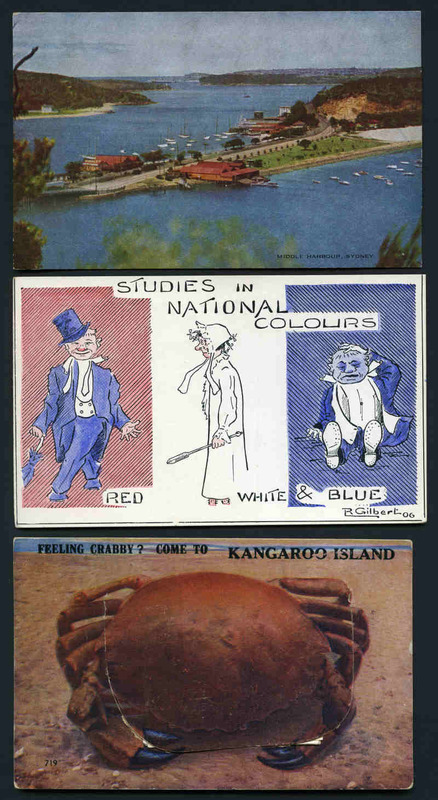 Noted The Bush Steeple Streaky Bay by George White, A Broken Hill Dust Storm (2 different), An Artist's Model, A Finished "Artist", Studies in National Colours and A Little "Seen" Glamour cards by R. Gilbert, "Bah = ah" The Naughty Quince Made Me Sick, And I Don't Want To Go To School - Bah = Ah! 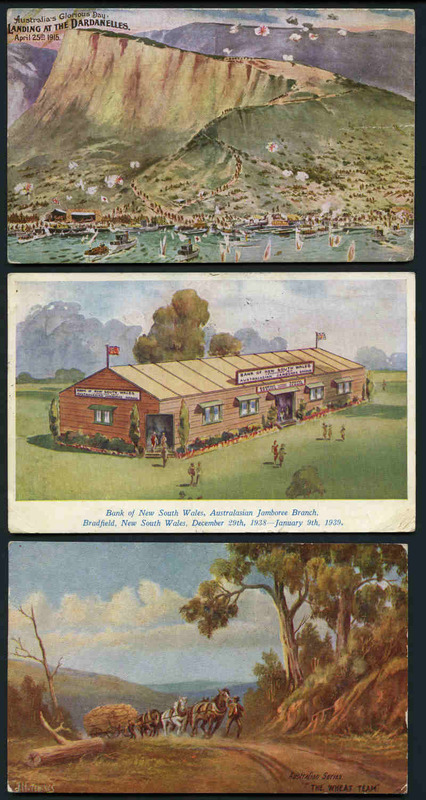 by Phil May and Victor Harbour Blacks, S.A. 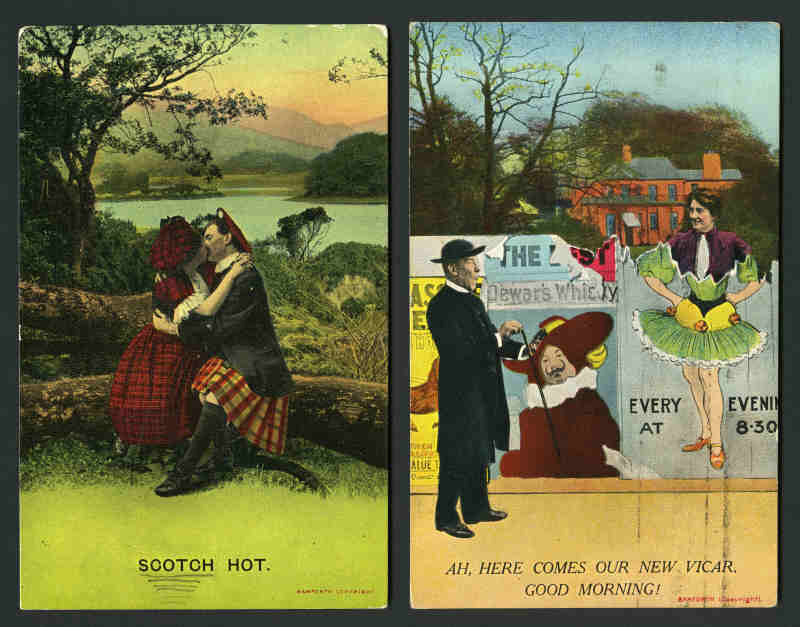 Condition varies.